Turn your data into insight. Once the solid base is in place, the process of sifting through the content to drive deeper understanding begins. StatSlice guides clients through the journey of selecting, designing, and implementing expert analysis tools. 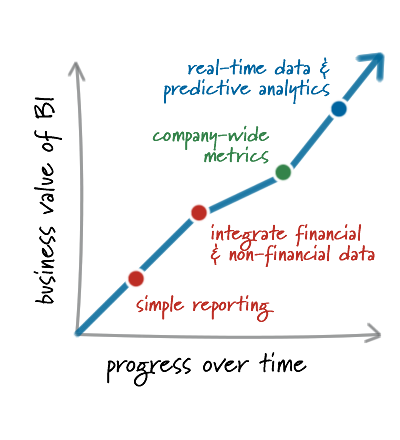 Consistent and accurate business rules and calculations must be derived in order to support both basic reporting and higher-end analysis techniques like predictive analytics and data mining. Predictive analytics encompasses a variety of techniques from statistics, data mining, and game theory that analyze current and historical facts to make predictions about future events. These methods enable corporations to better target their marketing, sales, and other efforts for more accurate credit scoring, cross-selling, fraud detection, and other advanced applications. StatSlice consultants are familiar with data mining and other techniques and integrate these results easily into business intelligence (BI) reports, dashboards, and other intuitive presentation formats. Our approach to analysis emphasizes a fast prototyping initiative that covers your key reporting needs while stimulating your own creativity to come up with new insights not obvious from legacy reporting.